The best thing about this simple meal is that every single ingredients has health benefits. Brown rice has fiber and lots of minerals including selenium, which has been shown to protect against cancer. Beans also have soluble fiber to lower cholesterol as well as calcium for bones. And don’t get me started about all the antioxidants in colored peppers! So here is an easy vegetarian recipe that’s super healthy. It’s high in protein and fiber and oh yes… flavor! By the way, high fiber meals keep you feeling full longer and that helps with weight loss. This is a recipe you can easily make your own with more jalapeno pepper for added heat, toss in your favorite extra spices, or use a different kind of bean. I really like red beans in this dish but I can never find canned red beans at the grocery store. Whole Foods carries one by Westbrae that I prefer so if you can find it, I think you’ll like the meaty texture of these beans. But a close second would be red kidney beans and even black beans would work. By the way, black beans are the highest in antioxidants of all beans. 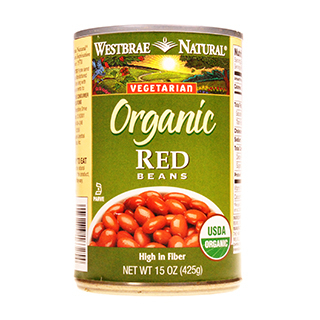 Basically you can’t go wrong with any kind of canned beans in this heart-healthy, easy recipe. Let’s talk about rice for a minute. Brown rice has more nutrients and fiber than white rice but if you’re short on time, you can make this dish with converted rice (I like Uncle Ben’s). 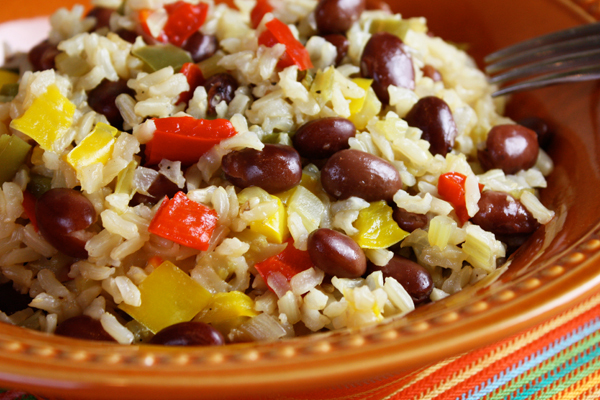 You won’t get as much fiber but you’ll still get protein, iron, and folate from converted rice and all the benefits (including fiber) of the beans and peppers. Both brown and white rice are gluten free. 3 Comments on "Red Beans & Brown Rice"
I’m a vegetarian, but I don’t look down on meat eaters, I just chose to be vegetarian because It’s something that I believe in and feel is right for me, but everyone is different and I don’t judge like some veg people haha. I too am always on the look for “meatless” meal ideas. Recently, we have been making crispy polenta, and instead of using all of the oil to pan fry it, we place it on a lightly oiled cookie sheet and bake it. It works pretty well, and it’s great on top of salads, or along side other things. I even like to put the crispy polenta on toasted bread and have it as a sandwich. I think it’s great to explore new ideas when cooking. Good luck, and I too love all of Jenny’s great recipes. My guy is always asking for beans and rice for dinner. So when I saw your Red Beans and Rice recipe yesterday, I knew what we were having for dinner. Not only was it quick and easy to prepare it was healthy and delicious. He’s a happy camper! Thank you Jenny! How about a video Jenny? We are trying to get in more “meatless” meals this year. Would love more videos on meatless meals. Thanks for all you do and really appreciate your in-depth explanations about why these meals are so beneficial!